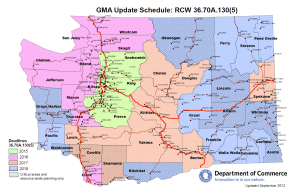 The Washington Economic and Revenue Council released its August Economic and Revenue Update on Thursday. Overall economic and revenue results are solid with strong employment growth both nationally and in Washington and continued increases in Washington exports. Yet, drops in construction employment and slowed residential construction permits may indicate a cooling in the housing market. 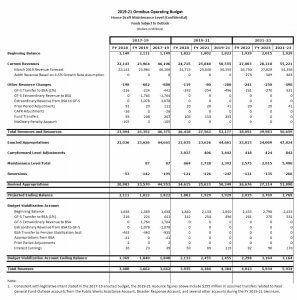 On the revenue side, tax collection in Washington continues to be strong with General Fund (2%) and Revenue Act (2.2%) collection both over 2% higher than June projections and cumulative 2018 collections that are now 2.6% above projections. 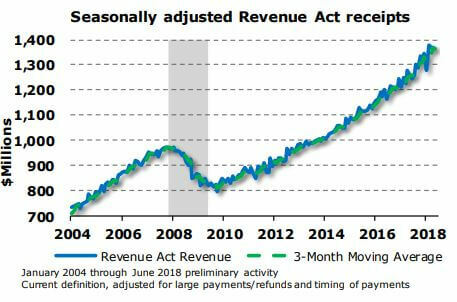 However, Real Estate Excise Tax (REET) collections from residential sales came in lower than forecasted, supporting indications of a cooling residential market. Non-farm employment rose by 18,100 jobs, 6,300 more than expected. However, construction jobs dropped by 500. Authorized building permits in the second quarter decreased to 43,200, 3,500 less than projected. Seattle area price inflation came in high at 3.3% compared to 2.8% nationally. Washington exports increased 3.7% in the second quarter of 2018 compared to the second quarter of 2017 fueled by a 26.8% rise in exports of agricultural products, likely higher in an effort to beat the implementation of tariffs that took effect the beginning of July. 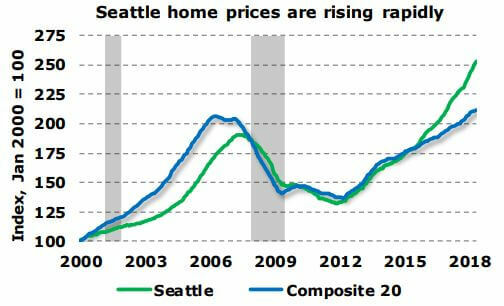 Seattle area home prices continued their rapid increase growing by 1.4% in May with year over year growth of 13.6% – over double the national average of 6.5%.